Edinburgh Capitals, wearing one-off red Santa Claus strips, certainly gave out some pre-christmas gifts as they were beaten 7-2 by Guildford Flames at Murrayfield last night. It was another poor performance on home ice, in which Capitals forward Sergei Banashkov was kicked out for slew-footing after 40 minutes, and perhaps green Christmas Grinch jerseys would have been more appropriate as a general lack of passion and effort in their play left fans bereft of festive cheer. Head-coach Dmitri Khristich was, under the circumstances, not overly critical of his players, but when the question was put to him directly he did not deny a lack of effort from his squad. Khristich said: “Lack of effort starts with one guy and then it spreads like a disease around the team. We started well, we had a small good spell in the second period, and the third period, having that five minute match penalty, as well as two minutes of five-on-three, was very difficult for us. “It’s another bad result, and it’s what we’re getting used to which is the worst thing. We have plans to change things in the new year, but until then we will just try to do our job with whatever we have. In fairness, Edinburgh really took the game to Guildford in the opening period, forcing Flames goalie Chris Carrozzi into 18 saves, whilst Edinburgh stopper Pavel Shegalo conceded two from the seven he faced at the other end. Carrozzi was standing on his head, forced into three saves in the opening minute, point-blank to deny Mike Cazzola, before a double save on Pavel Vorobyev after an end-to-end rush from the former Chicago Blackhawks winger. Caps’ pressure won them an early power-play opportunity, and Carrozzi again came up trumps robbing Rihards Grigors with his glove from the slot. The game began to turn when Igor Valeyev was called for both hooking and slashing, gifting Flames a four minute power-play and Brennon Yadlowski caught out Shegalo with a wraparound effort at ten minutes and 44 seconds. Guildford increased their lead four minutes later, Shegalo was way out of his crease and couldn’t hold a floated effort on goal from Liam Stewart. The rebound fell perfectly for Geoff Walker to fire into an unguarded net. Shegalo, at fault for Guildford’s first two goals, made some splendid saves early in the second period as his defence, already with their heads down, disintegrated around him. However, he would have been frustrated to concede a third, beaten at his near post by a shot from Great Britain internationalist Liam Stewart in the 28th minute. Stewart grabbed his second of the game six minutes later as he was left all alone by Edinburgh to score a tap-in. 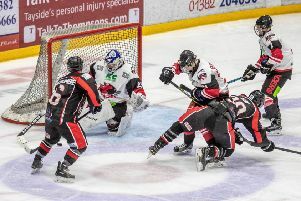 A great solo goal from Edinburgh forward Dylan Anderson lifted the spirits of the home fans, and indeed the players, but that was quickly quelled when Banashkov on the second period buzzer kicked the feet away of a Flames player and was ejected from the game for slew-footing. Guildford took advantage of the five minute major penalty, Brett Ferguson scoring on a rebound in the 43rd minute. Caps did well to survive a two minute five-on-three Flames power-play after Vorobyev was called for hooking by fussy match referee Pavel Halas. Cazzola, less than a minute after Caps returned to full strength, scored Edinburgh’s second at 45 minutes and 42 seconds. Guildford wrapped up the points with Yadlowski’s second and a late Ian Watters strike.